The SmartNav4 from NaturalPoint provides users with a hands-free means of cursor control. 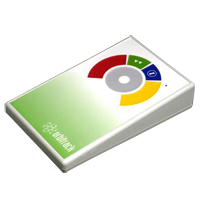 The high resolution tracking system employs a reflective surface to monitor head movement which is then translated into corresponding cursor movement on the screen. The reflective marker can also be located on other extremities where the need exists or where it may be deemed more practical. The SmartNav provides precise cursor control through simple head movement allowing the hands of the user to remain on their keyboard, or at their sides. Both models include a cable which support the attachment of either one or two external switches which can then perform Single or Right Click Functions in conjunction with the NaturalPoint software. The AT model provides the additional features of an on-screen keyboard and a "dwell-clicking" option (hover on a point for an adjustable length of time and the system will automatically generate a click). The "zero force" requirements of the SmartNav and the limited range of movement required to accomplish cursor movement also make it well-suited for users with strength limitations and mobility restrictions. To see examples of switches which can be used with the SmartNav 4, check out our Switches category. For ultra-low resistance mousing, add a Microthin Wow!Pad to your desktop and save 70% or more on ErgoCanada branded models, now available for between $2.00 and $3.00 each. Looking for external switches for input with your SmartNav4? View the various switch options here. The L-Trac Switch Adapted from Clearly Superior Technologies features the high performance and robust build for which the original PC-Trac line is well-known. The L-Trac features an optical laser sensor which offers "button selectable" tracking resolutions of 400, 800 and 1600 CPI, easily changed on the fly. Combined with this is the ability of the L-Trac to track at speeds exceeding 30 inches per second, even at a 20G acceleration rate. The scroll wheel is smooth and readily accessible, located above the center button. Unique to the Switch Adapted version of the L-Trac is the availability of three jacks which support connection of external switches. Connecting an external switch deactivates the on-board switch for that function - a feature which can be of benefit when seeking to eliminate accidental button activation. This means that the click activations can be performed from alternate locations more advantageous to the user. The L-Trac provides users with a precision, high performance pointing device. The large 57 mm diameter weighted trackball produces predictable, quick, and precise cursor control. Most users will find that movement becomes intuitive within a few minutes of use, with the level of control increasing over time. The level of performance and range of features, coupled with the proven contour of the L-Trac makes these trackballs an appropriate option for all applications including general computing, gaming and Computer Aided Design (CAD). CAD users love it because you can drag a line one pixel even on high resolution displays. Then, with a button stroke, they can fly around the screen to get general tasks done. Gamers have called it an "almost unfair advantage", citing the fingertip control and precision, high performance tracking. Designed to minimize the effects of contamination build up and the resultant degradation of performance, this high performance laser trackball uses highly polished stainless steel rollers. It has been found by CST that the "ruby ball sliders" used in most optical trackballs, cause performance degradation when gunk builds up on them. The L-Trac uses mirror polished stainless steel rollers that do not readily collect unwanted material and are easily cleared by spinning the ball rapidly. The Dupont Delrin bearings are embedded with Teflon and internally coated with a lifetime lubricant making the feel of this trackball extremely smooth and it's reliability very robust. The user-replaceable stainless steel rollers are extremely tough and designed to handle hard usage yet still provide users with controlled smooth movement. To see examples of switches which can be used with this trackball, check out our Switches category. The Orbitrack Control Ring from Pretorian provides users who have very limited range of movement or strength with a simple, almost effortless, means to perform cursor movement and click control. The Orbitrack employs a touch-activated surface similar to a touchpad but without the necessity of continuous finger movement to 'steer' the cursor. Cursor direction is determined by where a finger is placed in relation to a central point in the touch ring. Once contact is made the cursor will begin slowly moving in the desired direction, gradually increasing the selected maximum rate of speed (4 selectable speed options are available). The cursor will continue to travel as long as the finger remains in contact - no further movement is required until a change of direction is desired. Direction change is accomplished by moving the finger to a new location on the control ring. This can be accomplished by breaking contact with the control ring surface and repositioning the finger to steer the cursor in the new direction or by sliding the finger to the new location. Users will vary in their ability to use the second option and may opt for the first method until they learn to better control the movement. Requiring no hand or wrist movement, the Orbitrack represents a significant advance in computer input technology and is suitable for all computer users, particularly children and those with motor skill difficulties and movement impairment. The n-ABLER Joystick from Pretorian is specifically designed to address the needs of computer users with limited hand control, motor skill difficulties, poor hand-eye coordination, lack of manual dexterity, and muscle spasms. This functionality is packaged in a heavy duty housing designed to survive heavy use. High contrast coloured buttons and control surfaces assist users in determining position and function of the controls. 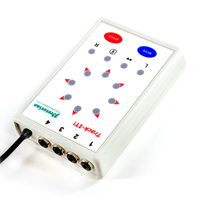 The n-ABLER Joystick provides cursor control as well as single-click controls for left click, right click, double click, and drag lock functions. 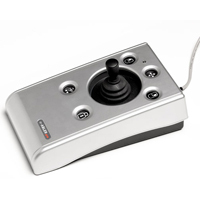 In addition the n-Abler Joystick also offers a "Locking Axis" function which locks the cursor to either vertical or horizontal movement, addressing the difficulty of cursor control for users who experience tremors or may struggle with fine motor control. Cursor control on the n-ABLER Joystick is provided by a joystick control which can be equipped for the individual needs of a user. Included are a standard joystick, a T-Bar handle, and a soft-grip ball. Dual mini-phono jacks also permit the attachment of a variety of external switches to provide users with easier access to the Left and Right click functions. Users who find the traditional orientation unsuitable have the option of 'teaching' the trackball to orient itself at 90° increments, freeing the user to change the housing orientation for optimum usage and comfort. The n-ABLER Joystick also offers an optional buzzer setting which provides notification as specific functions are activated or deactivated. The design of the n-ABLER Joystick offers precision control and requires only minimal hand movement. This can reduce wrist and elbow fatigue, as it requires noticeably less effort. The symmetrical design enables users to work with either hand without having to angle the wrist, and the unit can also be configured for 'left-handed' operation. Its large, integrated hand support/palm rest makes work posture more relaxed and less strained. 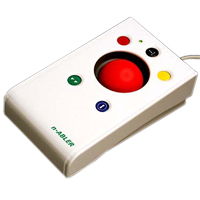 The n-ABLER Trackball from Pretorian is specifically designed to address the needs of computer users with limited hand control, motor skill difficulties, poor hand-eye coordination, and lack of manual dexterity. This functionality is packaged in a heavy duty housing designed to survive heavy use. High contrast coloured buttons and trackball assist users in determining position and function of the controls. 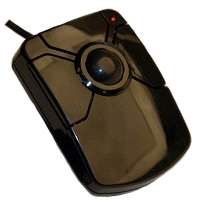 The n-ABLER Trackball provides cursor control as well as single-click controls for left click, right click, double click, and drag lock functions. 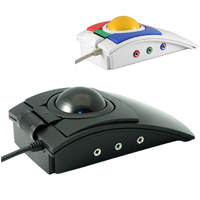 In addition the n-Abler Trackball also offers a "Locking Axis" function which locks the cursor to either vertical or horizontal movement, addressing the difficulty of cursor control for users who experience tremors or may struggle with fine motor control. Cursor control on the n-ABLER Trackball is provided by a large 63 mm, free-running ball which responds to minimal effort. To avoid accidental movement the trackball projects only slightly above the housing, with the activation buttons fully recessed to avoid accidental activation as well as to aid users in button targeting. Dual mini-phono jacks also permit the attachment of a variety of external switches to provide users with easier access to the Left and Right click functions. Users who find the traditional orientation unsuitable have the option of 'teaching' the trackball to orient itself at 90° increments, freeing the user to change the housing orientation for optimum usage and comfort. The trackball also offers an optional buzzer setting which provides notification as specific functions are activated or deactivated. The design of the n-ABLER Trackball offers fingertip precision control and requires only minimal hand movement. This can reduce wrist and elbow fatigue, as it requires noticeably less effort. The symmetrical design enables users to work with either hand without having to angle the wrist, and the unit can also be configured for 'left-handed' operation. Its large, integrated hand support/palm rest makes work posture more relaxed and less strained. The Switch2Scan from Pretorian Technologies supports scanning switch access for "idevices", providing access to all iPad functions. Employing the Switch2Scan, users are able to use standard switches to control Apps, access media and iBooks, and even perform data entry. The Switch2Scan can utilize either the Voiceover feature that is available in all releases of iOS or the Switch Control function which is included in iOS 7 and newer releases. The Swith2Scan connects to the idevice via Bluetooth wireless, leaving the viewing device free of inconvenient cords. Switch Scanning will permit full access to functions with just a single switch but for enhanced capability the Switch2Scan will support the connection and programming of up to 4 standard external wired switches. The extremely small footprint and a long-life lithium-ion rechargeable battery make this a device of convenience. Scanning speed is variable, can be both forward and backward, and can be performed in manual or automatic modes. 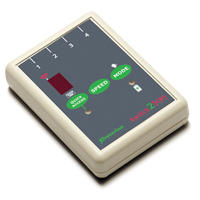 The Track-It Switch Interface from Pretorian is a unique switch interface that allows complete operation of the cursor, and mouse button clicks, using a single, remote switch. Track-It is designed for users with motor skill difficulties, particularly those who find conventional access impractical, and has a number of programmable options allowing the user to ‘personalise’ the functions for ease of use. The Smart Cat AG Touchpad from Cirque Corporation provides users with superior cursor control and advanced functionality. Cursor tracking with the Smart Cat is accurate and reliable - always following the "point of first contact", unlike other less-advanced touchpad devices that have difficulty when a second contact is accidentally made. The Smart Cat AG offers both single and multi-finger gestures to provide quick access to standard functions of left and right clicking, zoom, scroll, pan and as well as other actions. This popular model of the Cirque Smart Cat Touchpad family offers an affordable ergonomic alternative to a mouse without sacrificing functionality. The Smart Cat AG is equipped with 4 mechanical buttons which perform standard left, right and middle clicks but which can also be programmed to complete custom commands or functions. The low profile design virtually eliminates the potential for wrist extension and the ambidextrous design accommodates used with either hand for those with to spread the load between hands. Note: Multi-finger gestures and some of the Special Features are only available with the Windows OS GlidePoint driver installed. Mac users can access standard touchpad features of cursor control and clicking as plug'n'play functions. Users looking for additional functions and touch-activated command options may be interested in considering the Smart Cat Pro AG which offers numerous additional features and even greater programmability. Le Smart Cat AG Touchpad de Cirque Corporation offre aux utilisateurs un contrôle supérieur du curseur et des fonctionnalités avancées. Le suivi du curseur avec le Smart Cat AG est précis et fiable - en suivant toujours le «point de contact initial», contrairement à d'autres dispositifs tactiles moins avancés qui ont des difficultés lorsqu'un deuxième contact est accidentellement créé. Le Smart Cat AG propose des gestes simples et multi-doigts pour fournir un accès rapide aux fonctions standard de clic gauche et droit, de zoom, de défilement, de panoramique et d'autres actions. Ce modèle populaire de la gamme Cirque Smart Cat Touchpad offre une alternative ergonomique à la souris sans sacrifier la fonctionnalité. Il y a 4 boutons mécaniques sur le Smart Cat AG qui effectuent des clics gauche, droit et millieu, mais qui peuvent également être programmés pour compléter des commandes ou des fonctions personnalisées. La conception à profil bas élimine pratiquement le potentiel d'extension du poignet et la conception ambidextre s'adapte à l'une ou l'autre des mains pour balancer les actions d`une souris entre les deux mains. Veuillez noter: Les gestes multi-doigts et certaines fonctions spéciales ne sont disponibles qu'avec le pilote Windows OS GlidePoint installé. Les utilisateurs de Mac peuvent accéder aux fonctions standard (contrôle du curseur et les boutons clics) du touchpad en tant que fonctions plug'n'play. Les utilisateurs qui veulent des fonctions supplémentaires et des commandes avec activation par touche vont peut-être vouloir considérer le Smart Cat Pro AG qui offre une grande gamme de caractéristiques et beaucoup de programmation. The MicroTrac Trackball from Clearly Superior Technologies offers a surprising degree of performance packed into a small package. The diminutive housing means the MicroTrac can easily fit in the palm of the hand, potentially reducing fatigue by reducing the need to reach for a mousing device. Users with average or larger hands may well be able to perform all functions with a single hand, using the thumb for button activation and trackball control. Those with smaller hands will easily be able to perform all functions with two hands since reaching with the thumb may not be sufficient. 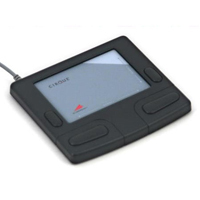 Alternatively, the MicroTrac can be placed wherever desired and used as a traditional trackball, with rubber feet ensuring secure positioning. The exceptionally compact design also means this device can be used by those with very limited range of movement or even by small children and yet users with large hands can still achieve reasonably effective control without feeling overly constrained by the compact size. Although the MicroTrac trackball has minimal mass and is therefore unable to 'spin' freely as do its larger PC-Trac and L-Trac cousins, the built-in dynamic motion enhancement provides single-pixel control while still offering rapid movement over greater distances. Rolling the ball faster exponentially increases the cursor speed across the screen, move the ball slowly and you get single pixel accuracy. This three button trackball requires no special drivers or software. The middle button can perform both Drag-Lock and Scroll-Lock functions. An indicator LED notifies users when the Scroll-Lock mode is activated. Load balancing between hands is encouraged by the ability to simultaneously press all three buttons to switch them between Right and Left format. With the MicroTrac you can work precisely and comfortably for hours at a time. The Drag Lock feature makes this product more comfortable by eliminating the need to hold down a button to highlight or select items. Simply tap the Drag Lock Button and the button stays 'locked' until hit a second time. The MicroTrac also far outperforms similarly-sized trackballs by offering much smoother movement combined with the superior control provided by the Dynamic Motion-Enhancement. 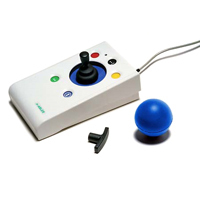 The n-ABLER PRO Joystick from Pretorian is specifically designed to address the needs of computer users with limited hand control, motor skill difficulties, poor hand-eye coordination, lack of manual dexterity, and muscle spasms. This functionality is packaged in a "Professional" housing that will blend easily into office or classroom environments, reducing undesired attention. The glossy silver upper housing offers limited resistance to hand repositioning and the black buttons feature contrasting white legends for increased visibility. The n-ABLER PRO Joystick provides cursor control as well as single-click controls for left click, right click, double click, and drag lock functions. In addition the n-Abler PRO Joystick also offers a locking "Pan" function which enables vertical and horizontal scrolling using the trackball without the need to hold down a button. It also features an "Anti-Tremor" function with three settings to enhance cursor control for users experiencing hand tremors of varying degrees. Users who experience muscle spasms or extreme tremors may be interested in considering the n-ABLER Joystick or n-ABLER Trackball, both of which feature an "AXIS LOCK" which locks the cursor to the Vertical or Horizontal Access. Cursor control on the n-ABLER PRO Joystick is provided by a joystick control which can be equipped for the individual needs of a user. Included are a standard joystick, a T-Bar handle, and a soft-grip ball. Dual mini-phono jacks also permit the attachment of a variety of external switches to provide users with easier access to the Left and Right click functions. Users who find the traditional orientation unsuitable have the option of "teaching" the trackball to orient itself at 90° increments, freeing the user to change the housing orientation for optimum usage and comfort. The n-ABLER Joystick also offers an optional buzzer setting which provides notification as specific functions are activated or deactivated. The design of the n-ABLER PRO Joystick offers precision control and requires only minimal hand movement. This can reduce wrist and elbow fatigue, as it requires noticeably less effort. The symmetrical design enables users to work with either hand without having to angle the wrist, and the unit can also be configured for 'left-handed' operation. Its large, integrated hand support/palm rest makes work posture more relaxed and less strained.